In the far reaches of wild space everything is possible. Something new has emerged. A new power that will carve a path in this untamed quadrant of space. A couple of Worker Bee construction drones have stumbled on a piece of wreckage. All to common in this part of space. With no universal law present piracy is abundant. A dangerous part of space but also ripe with … opportunity. The worker Bee construction drone is small, fast and able to conduct a number of tasks. It comes in a variety of flavors. Cargo, salvage, repair and power. This little craft is easy to add to any ship or station design. It will only need a single docking block! 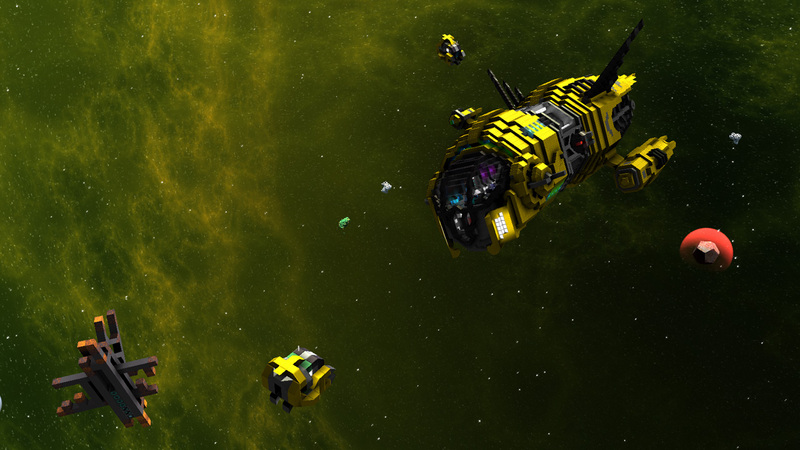 No fleet should be without these busy bees. The download includes all 4 version. Nice!! I really like these. They are so....cute. I would love to see little variations, maybe a suicide version w/ disintegrators, another one to clear minefields... maybe call them army ants? I especially love that they dock in the standard box. Good work. CreeperWorkerBee: Why are you running away? I just want to give you a … hug. I'm not sure if this is right or not, but i hope it is as i really like the idea, are you telling a story and releasing ships as they come into/become relavent to the story? It’s how they appear to me using the default textures. Yes. I will be releasing builds as they are featured here. This will be a similar setup as my ‘Wild space expansions’ thread on the old forums. Having a couple of worker drones is nice and all but if you really want to get some work done you call in the professionals. 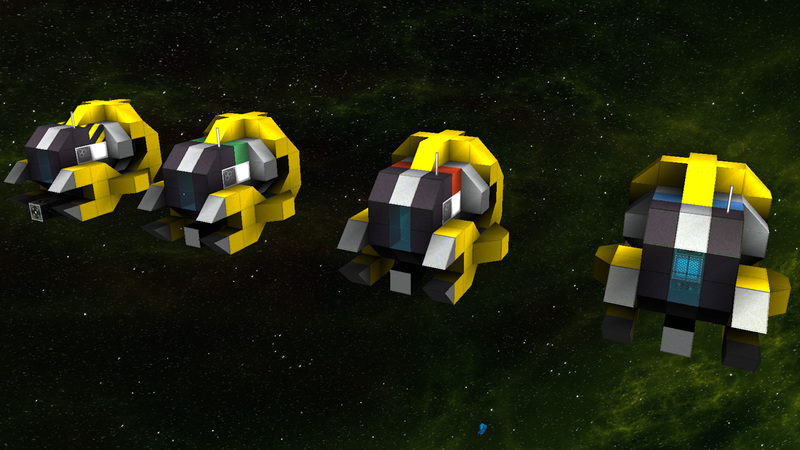 The Queen Bee is a tough little ship able to coordinate the work of multiple drones. This will speed up the gathering of resources considerably. And out here in Wild Space that’s just the thing you need. Get in, get the goods and get out. Locking the last drone in place The Queen Bee closes its bay doors and sets its destination for the next sector. There is plenty of debris left to scan. And who knows, there might be something valuable to salvage next time. 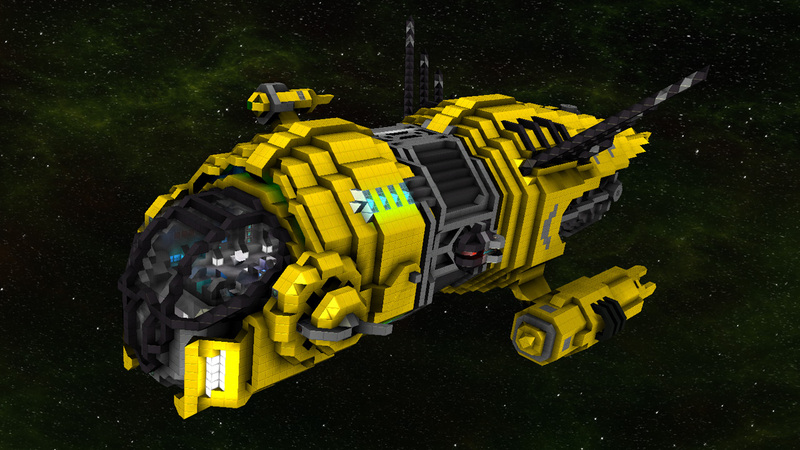 The Queen Bee is a worker drone carrier able to operate on its own or as a support ship of a fleet. Although not a war ship it is equipped with a twin light turret system to deter hostile pirates. In addition the ship has a D1000 missile array installed. Mainly used to break up asteroids or debris its explosive missiles are not something you want aimed at your ship. Together with its though plating and considerable shield regeneration makes it’s a tough nut to crack. However The Queen Bee’s main function as a support vessel is where the ship really shines. Its compliment of 4 worker drones allows for a wide variety of tasks. 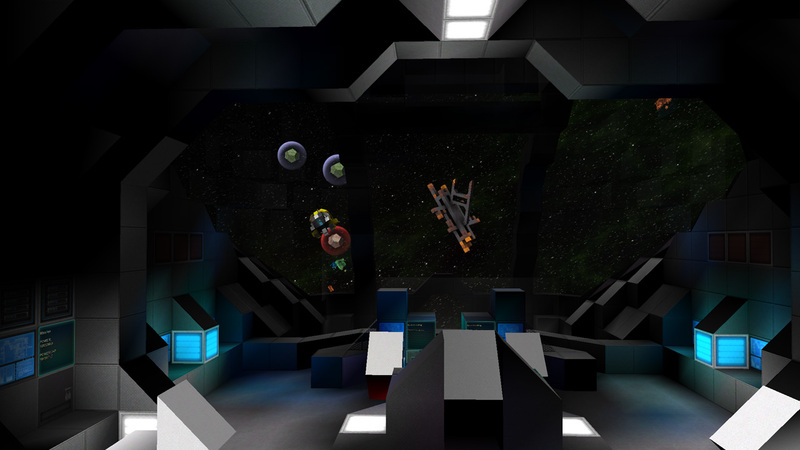 The ship itself is fitted with a powerful salvage array to get those valuables hiding in any asteroids or abandoned ship. The addition of a direct energy feed allows the ship to power any ship or station long enough to enact repairs on damaged systems. Thats a very well built ship. Are there interior shots? There is not a whole lot of interior. Two posts up is a nice shot of the bridge area. Then there is the drone bay and the access hatch and core room. Not a lot of room for something else. Improved the drone bay significantly. It’s a lot easier to dock or undock the drones now. Menacing RED missiles. Just because. Added some additional shield regen to the turret system. Added a fancy grill to the front flood lights. Added a cool cinematic camera point to the captain’s chair. Cool! Was about to take a look (downloaded it yesterday), and now I know there's a new version! No new ship today but another update to the Queen Bee. I mainly wanted to wait until FTL was released. So expect new content soon. Fixed a couple of internal and external hull issues I wasn’t happy about. Added an additional salvage beam block per group to the salvage drone. Added additional power to the drones. 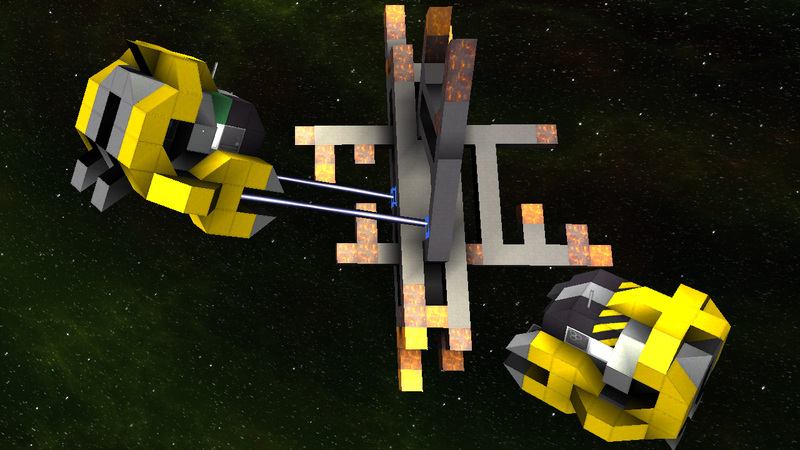 Added a repair beam system to the main ship. Overhauled the turret system with a more robust version. Amazing, the curves in your ships are great, the colors look good together and the designs are awesome. Keep it up man!